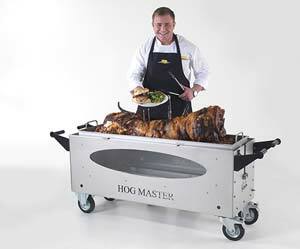 In this age of fashionable, designer food, we think that our Hog Master hog roasting machine offers a refreshing change. With the Hog Master you can cook good quality, mouth watering, hunger -satisfying food. 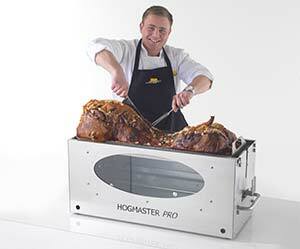 We only offer our hog roast machine for sale because we know it boasts outstanding quality and durability. We understand the world of hog roast catering which is why we set about designing our own machines. We designed the Hog Master machine with not only the user, but great quality results in mind. We also wanted to optimise the performance of the machine giving it not only great finished results, but an increase in its versatility. We did this by adding attachments which enable it to cook a variety of meats: along side the traditional spit roasted pig, with our unique attachments you can also cook, whole lambs, beef and rotisserie style chickens. While we know that the main dishes of whole roasted pig or lamb make a dramatic centre piece for any meal, we also know that like any meal they need to be accompanied by other foods. In addition we have incorporated two methods of hog roasting. The first being the traditional spit roast where the pig turns on a pole above the flames, this method gives a great evenly cooked pig, but for the less experienced we have also devised a hog roasting tray. This method gives the same great results and the tray will also support the full weight of the pig. This is why our fantastic hog roast machine made to our own design, is capable of cooking all the foods needed to make a delious mouth watering meal for all your clients, no matter how large or small their party. Because the hog roast machine for sale is gas powered and doesn’t produce the smoke and smell associated with the more traditional machines, it can now be used just as easily for indoor catering as outdoor. This was an important issue for us when creating this fantastic machine as we want you to gain as much use with it as possible. As well as its thermostatic gas power, our machine also comes with four sturdy wheels which make manoeuvrability so much easier and more convenient. You know with our machine there will be no problem with accessibility as it really is as easy as wheeling it to the venue. To finish, the whole machine is made of tough stainless steel giving it a pleasing over all look and making it incredibly hygienic and easy to clean. When we offer a hog roast machine for sale we do so in the full knowledge of the superior quality of the machine and the quality of care you will receive. We also offer comprehensive training because it’s important to fully understand your hog roasting machine in order to get the very best from it. Because we have chosen to do all our manufacturing here in the UK, if the need for spare parts should arise we can guarantee next day delivery. The machine also comes with a 12 month warranty.